Priscila Cachoeira is a well-known Brazilian mixed martial artist currently signed up with the UFC promotions and competes in the Flyweight division. Fighting out of Niteroi, Rio de Janeiro Brazil, she was interested in martial arts from a very young age. She is a blue belt in Brazilian Jiu-Jitsu. She started professionally participating in MMA on June 11, 2016, and so far has appeared in 9 events with a total of 8 wins and 1 loss. 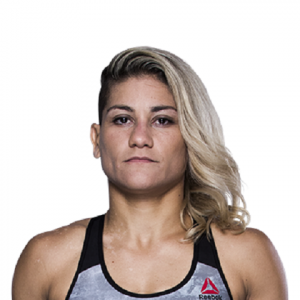 Participating in the Flyweight division, she is one of the most liked MMA athlete currently signed with the UFC since Feb 3, 2018. Priscila Cachoeira grew up in Niteroi, Rio de Janeiro Brazil and started practicing Brazilian Jiu-jitsu. "I started training for fighting about three years ago. It was a way of staying away from bad company and relapsing from a serious drug problem I had for years. Fighting saved my life. It gave me hope and a purpose when I was lost. " She holds Brazilian nationality and is currently in contract with UFC with having 30.4k followers on her Instagram profile. Priscila Cachoeira started her career in YC- Your Chance 1, where she fought against Claudine Costa ended with a unanimous decision. Later in HFN 2, she fought against Paula Baack on August 13, 2016. In September, she fought against Amanda Torres Sardinha ended in favor of Priscila. Later on, she fought against Alexandra de Cassia Rodrigues on Dec 16 which is also won by herself. She at CTF 10 fought against Laisa Coimbra ended winning the match. Stepping up, she again appeared in FLC 5, where she fought against Karoline Martins which also ended in her favor. Later on, she appeared in Curitiba Top Fight 11 and HFN 3 where she fought against Marta Souza and Rosy Duarte wherever, both matches were won by her. After, she signed to UFC on Feb 3, 2018, where she fought against Valentina Shevchenko ended with her loss. She is so far living a single life and no news regarding her relationship or affair has surfaced in the media. She has made her life so private which hardly ensures anything about her personal life. Moreover, there is no information regarding her past affairs and boyfriend. She is 5' 7" ( 170 cm ) tall and weighs 125 lb ( 56 kg ). The MMA fighter has 65" reach. Talking about Priscila Cachoeira salary, she is estimated to have earned around $42,000 from her last fight against Valentina Shevchenko on Feb 3, 2018. As per many tabloids, her current net worth is reportedly around $1 million and so far his main source of income remains her career as a fighter. She is a resident of Niteroi, Rio de Janeiro Brazil and has a lovely home there.